I love languages. I love reading and writing in my native English, and I love learning new languages. 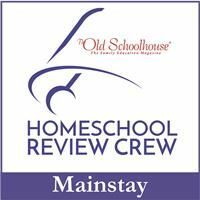 So imagine my excitement when the opportunity to review Mango Homeschool Edition from Mango Languages came up on The Schoolhouse Review Crew. Ecstatic! I’ve talked before about our foreign language pursuits with the boys. 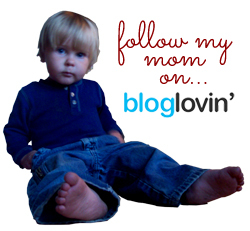 Remember last summer when I posted about our upcoming homeschooling plans? I mentioned that we were going to try to learn Spanish. Well, that didn’t work out too well because I don’t speak enough (read: any) Spanish to have been able to teach the boys. So we switched to French. I speak enough French to have begun working with the kiddos, but we were quickly getting to a place where I needed more help. It has been 15 years since I graduated high school, after all, and since I don’t have the opportunity to travel often, there was no real way for me to continue cultivating my French skills. We used books from the library, and when I was given access to SchoolhouseTeachers.com, we used the French lessons on there. But I was still itching for something even more. Mango Homeschool Edition turned out to be just the thing! Mango Homeschool Edition is appropriate for almost everyone in your family. The suggested age range is 7 and up – like a board game … You’re never too old! It has over 50 languages to choose from, most of them “serious,” but also a “silly” one or two, including Pirate. That was the first one my husband wanted to check out, of course! He’s just a funny guy to his core. But for the kids and me, we were pretty serious about just doing our French. Mango Homeschool Edition works using a translation method, meaning they say to you (in English) “Here’s how you say ‘Hello.’ ” Then a native speaker comes on and says the word and/or phrase so you can hear proper pronunciation. Then you get a turn to try it out. You can connect a microphone to the computer if you have one for pronunciation comparison, or you can just speak aloud to yourself. The program uses a “slides” system, meaning it gives you the information in short bursts. You click through from one slide to another. Some of the slides, like the one above, are words or phrases that you’ve already learned. They give you a little clock, and your goal is to come up with the correct translation of something you’ve already learned. If you’re stuck, you can add more time while you think or you can just get the answer. If you don’t remember the phrase, be assured that it’ll come up in a future slide. They’re really good about repetition in Mango Homeschool Edition. Other slides, like the one pictured below, are culture slides. They tell you things about the culture of the language you’re studying. Those are just as important as the language slides, in my opinion, because you want to know what you’re getting yourself into if you ever travel to a country in which you’ll use your learned language (and that is, after all, the ultimate goal when learning a foreign language). Similar to the culture slides are grammar slides. It’s important to remember when learning a new language that even though they may use the same alphabet as English, they rarely follow the same grammatical rules. 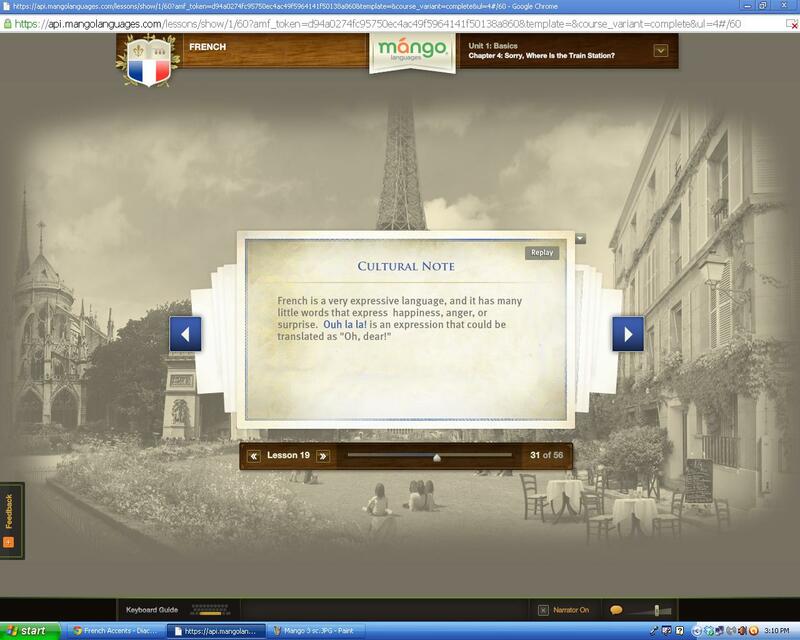 French, for instance, is a Romance language and uses masculine and feminine markers for nouns. We don’t do that in English, but it’s a vital part of their language, so it was one of the grammar slides. Beyond the explanation I just gave with how the program works, you need to know that Mango Homeschool Edition is completely web based. You have to have a good internet connection and the current Flash player. It does not work on mobile devices. Additionally, each member of you family will have his or her own account. If it’s just you learning, the price is $18/month or $125 a year. For each additional member who wants an account, it’s an extra $10 a month or $50 a year, up to 5 members. For 6 or more, there are special group rates, depending on the size of the group. The program works in “Chapters,” each one based on a conversation. You hear the conversation in the first lesson of the chapter (if you’re completely new to your language, it sounds like gibberish! ), and then throughout the next 4-6 lessons, you learn each piece of the conversation. By the end of the chapter, that conversation that sounded impossible to decipher is something you can actually understand! We don’t have a mic, so I sat with the kids during their lessons each day to help them with their pronunciation. It took a little more time than it would have if I’d been able to send them to do it themselves, but it was good for me, too. The kids did their lessons separately – otherwise they argued over whose turn it was to say the phrase first, and honestly, it was better for them to each have to come up with the correct answer on their own rather than repeating what their brother said. Mango Homeschool Edition is a really good program. It really took our foreign language lessons to the next level – something I wouldn’t have been able to do on my own. The system is attractive and easy to use. The only thing I was unsure about was the fact that it uses the translation method. In my mind, it seems like it would be harder to become fluent using the translation method because you’re always having to go back and forth between two languages in your head to say anything. On the other hand, the more you practice, the better you’ll get – regardless of method. So in the end, I think it’s a fine way of teaching languages. Mango Homeschool Edition was a great fit for our family. We still have a long way to go before we can move to France, but we’re way better off than we were two months ago in our pursuits of the French language and culture.